A new product has snuck it’s way into my daily routine. I try so many different serums to review so the ones that make it to my routine have to be pretty fab, and the Nip + Fab Glycolic Fix Serum definitely doesn’t disappoint. I’ve written about Glycolic Acid a few times recently – it is an ingredient used frequently in facials and is known for its exfoliating properties, and it removes dead skin cells revealing fresh, clean skin. 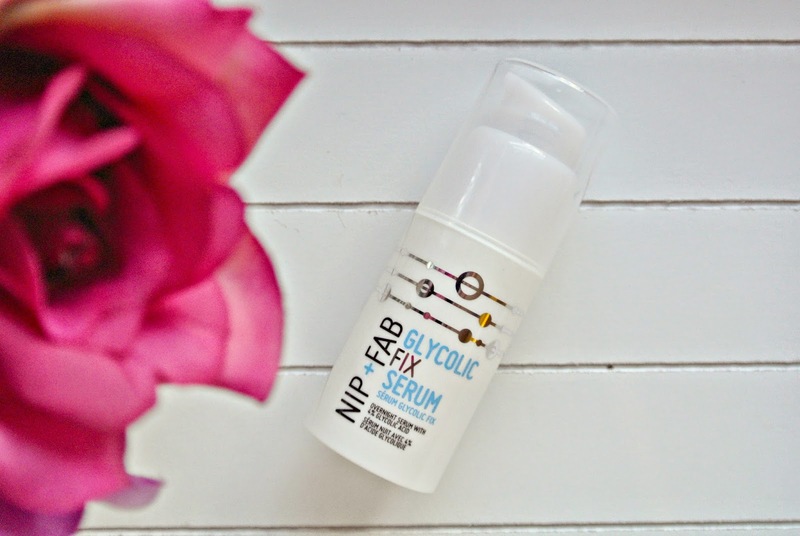 The products from Nip + Fab contain a small amount of Glycolic Acid but even with the low percentage, I have seen improvements in the clarity of my skin – especially those pesky little bumps. The Glycolic Fix Serum is applied after you remove your makeup – I use it before bed and sometimes apply a little moisturiser too. I feel like the serum has helped to plump my complexion, smoothing out any little lines and wrinkles. I’ve used stronger products before which feel like they burn/tingle away the badness in my blemishes, but this is gentler but seems to deliver the same effect. The serum is part of the Anti-Aging range from Nip + Fab, i’ve heard great things about the pads and Glycolic fix cleanser too, has anyone tried them? I’d love to know your thoughts! The serum is £14.95 and you can get it from Boots.